Welp, our Christmas weekend over here was...interesting. Remember last post when I had mentioned Henry had become sick? Well, Eliza ended up getting sick the night of my family's Christmas party...at 4:30 a.m....in my parent's nice guest bedroom bed...with all Ralph Lauren pillows and Martha Stewart bedding...and all over me. I quickly spot cleaned and washed all of my mom's bedding, took a shower and we hightailed it out of there by 6:30 a.m. Eliza was the sickest during the car ride, but once we arrived home she was back to normal in no time. Two things. One - Watching your baby be sick in a car is awful because of them having to be strapped in. Two - My Mom's a genius. She keeps empty coffee containers around just in case this type of thing happens. Sick person...car...coffee containers with lids... Gross, but genius. I'm telling you, it's a lifesaver. Tell your friends. Christmas Eve had arrived and we had decided to take the kids to see Moana. Very cute movie. We bought popcorn and slushies for the kids. Now, usually Jon and I would be gluttonous and devour all the movie theater goodies. Nope. Not this time. After the movie we went straight home and I had a moment of a crazy hot head, followed by nausea and then I felt as though I was going to pass out. Meanwhile, the sickness was in full attack mode on Jon's body. He was in bed most of Christmas Eve and basically all of Christmas day. He did have an adrenaline rush on Christmas Eve and managed to put together Eliza's beast of a dollhouse, but from that point on, I really didn't see him again until late Christmas day. As for me, I keep having these crazy nauseous moments, followed by a hot head and feeling faint. I'm not sure if it's the "sickness" or stress or what, but I'm soooo over it and I'm currently making deals with myself on what I'll do when I'm healthy. Speaking of food, we did have some "healthy" moments before the weekend began. We made and decorated sugar cookies. FYI - most of the cookies stayed home after the sickness. Well, except for the ones we gave my parents, which I'm assuming they threw away - I don't blame them. Elmer was on point this year! Eliza kept dressing like this all last week. My only thought was that she wanted to be like Mary...you know, like THE Mary...or some sort of interpretation of Mary Poppins/a fairy princess heading to a garden party? Elmer left a cool science experiment with Skittles. We needed a car wash so I took the five minutes to flip through my planner and take an "I'm-crazy-exhausted selfie." Ahhh...yes - Thursday night. The night of my family's Christmas. The kids had a blast! This is Henry and his awesome cousin, Christian. My parents bought both of them tents and headlamps. They were pumped! ............it was only hours after this picture was taken that we bee-lined it for home! We arrived back home and took it easy all day. Eliza even felt well enough to decorate her gingerbread house. Later that night, our amazing neighbors left yummy goodies on our front porch along with these shirts. Jon and I are originally from a couple of towns north of Flint. We drive through Flint whenever we head back to our parents' houses and once we arrive in the city, I feel like we're "home." Christmas Eve had arrived and Elmer had packed his bags and was ready to head back to the North Pole. He had left a letter stating that since both kids were on the good/nice list, there were able to hold him all day. It was hilarious because the kids were sooooo gentle with him...almost nervous in a way. The kids took him to the movies, but I told them that they needed to hide Elmer so that other kids wouldn't get upset if they didn't have their Elf, too. Both kids were also concerned about his seat belt while traveling to the movie theater and where he'd sit during the movie itself. Just to be clear, Eliza and Henry took turns holding him in the car, so that he was nice and safe - safety first! As for the movie, Henry found a nice cup holder for Elmer to sit in so that he wouldn't miss out on any of the movie. LOL! It was the cutest thing! Many cartoons and a movie later, Jon and I sucked it up and tried to make the best of our Christmas Eve. We also made sure to feed the Reindeer before it became too dark. Check out Eliza's outfit. I was waaaay too tired for a fashion debate, so whatevs. The kids couldn't contain their excitement for presents, so we let them open one gift they had picked out for each other. They were soooo excited! We set out milk and cookies for the big guy. Jon mustered up the energy to put together Eliza's dollhouse. I was done wrapping and just "done" in general, but ate cookies, and watched, "It's a Wonderful Life," while providing moral support. I think we finally headed to bed around 1:30 or so? We couldn't wait for the kids to see their presents! Henry had asked for a vending machine. Aside from building one from scratch, this is what we (mostly Jon) came up with. Henry looooooved it! The view. Santa had officially arrived. Needless to say, Henry was thrilled with his "vending machine." Here's their reaction to seeing Santa in our house! After the opening of presents had commenced, I tried my best to make it an enjoyable Christmas morning...sans Jon. I filled up my new Magnolia Market mug with coffee, put on my Santa hat, tied on my Santa apron and got to work on a big Christmas breakfast! After breakfast, I helped assemble a Lego castle for Eliza, not realizing it had taken me an hour or two to put together. I swear when I began the assembly it had just been 11:00 a.m., but when I walked out to the kitchen after I had finished it was 1:45 in the afternoon! I was all, "WHOA! Did I miss Christmas?" From that point on, I forced myself to sit down and check out a couple of my gifts and just relax. So I poured more coffee and I just sat. At one point I even fell asleep for a bit. It was glorious. Oh and you guys, Jon bought me this book and it's hilarious!!! I can't believe this is how women were once viewed and expected to behave. He also bought me, "The Magnolia Story" book and this white perpetual calendar. Can you sense a theme here...with the mug and this book and the calendar? Methinks, the Hubby went to the Magnolia Market website and just clicked on whatever looked good and called it a day. LOL! I mean, I'm not complaining. Not. At. All. Henry realized that Elmer had forgotten his bag. So he wrote a letter, packed up Elmer's bag and out to the mailbox the letter went. I was terrified I'd forget to grab it that night so I set the alarm on my phone as not to forget about it - and so the mail lady wouldn't be confused out of her mind! Ha! Luckily, Jon grabbed it the next morning. What a good guy! The day after Christmas, we headed to my sister-in-law's house for Jon's family's Christmas. With all the sickness and craziness going on, this was literally the best family photo we got. We did get a few family photos from Christmas night of all of us, but it looks like we all just woke up at 8 o'clock in the evening. Ha! Anyway, I bribed Henry to smile for this one, but nothing. I'm so sad we didn't get a family picture of all of us smiling, but to be honest, I was almost too tired to parent. Bahaha! So I let this one slide. 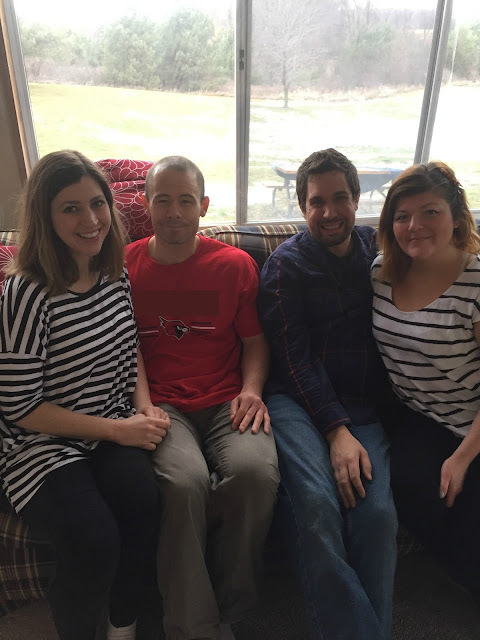 We did, however, get a nice photo of Jon and I with his sister and our brother-in-law! It's been years since we've taken a picture together. How does that happen?! Also, do you like the matching striped shirts? Totally not planned. ....Aaaaaaand here we are as of yesterday at Hobby Lobby. I couldn't resist the after-Christmas-sales, but I've got to tell you that I felt soooo sick while shopping. I had to literally squat down and try not to pass out in the store twice. I'm still not feeling the best. So, here's hoping I can be as happy and smiling as these two munchkins in the coming days and get over whatever sickness I'm fighting. Happy healthy days to you and yours! Hey guys! 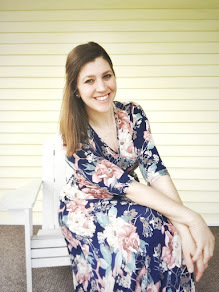 I thought I'd link up with B Loved Boston and join in on the life lately/weekend recap link-up fun. 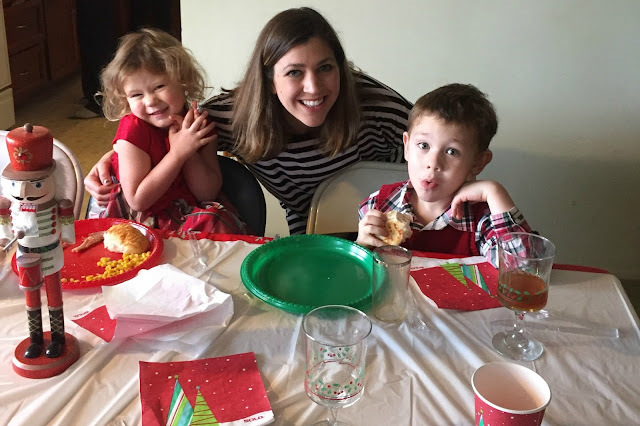 We've been so busy over here lately and I finally have a second to breathe, so why not breathe and blog a little, too, right?! The start to our weekend/Christmas break didn't go exactly as planned as my family's Christmas was canceled due to a potential snow storm and possible icy roads. I was totally bummed all day on Friday because I was really looking forward to seeing my family over the weekend. I've also had to rearrange my plans for this week. Sometimes it's hard for me to adjust when life goes totally wonky. But, everything will work out and we have my family's Christmas in the books for this week...so we'll make it work. Also, Henry was sick all weekend. So it was probably for the best that we didn't head back to see my family anyway. He had a half day of school on Friday and after I had picked him up he was just a wreck all day. There was lots of whining and crying and complaining. At first Jon and I just thought he was tired from the week, which was probably true, but as the night progressed he continued to act out of sorts. We attempted to head to dinner, but not soon after we all piled in the car, we realized dinner probably wasn't a good idea, so we turned around and came home. We walked in the door, gave the kiddos a bath and immediately put them both to bed. Eliza was sleeping by 6:30 and Henry by 7:00. Poor little man later woke up and started throwing up at around 9-ish. Let's just say, almost every sheet, blanket, duvet and comforter in our house has been washed. So with that, I'm sure you can imagine how the rest of the night went. Poor little guy just started feeling better yesterday and I'm now on pins and needles waiting for the next person in our house to get sick. Anyway, it was a crazy weekend. So, since I don't have a ton to share from this past weekend, how about I share with you guys what we HAVE accomplished this holiday season. We went to see Santa at our favorite Photography Studio. Every year this studio takes Santa photos before Thanksgiving to ensure the portraits are ready to go well before Christmas. We went back "home" for Thanksgiving to visit family and pig out on two delicious dinners. My father-in-law constructed these swings and the kids loved, loved, looooved it. I went to one of my Dad's stores to pick up a few things before we left town. I love his adorable stores and I'm going to miss them so much. My parents are currently in the process of retiring and it's oh-so-very-bittersweet. We went to one of our favorite town's Holiday Retail Open House. There are carolers, free hot cocoa, free hot apple cider and carriage rides. It always puts me in the holiday spirit. Oh yeah, and there are free snacks and cookies, too! 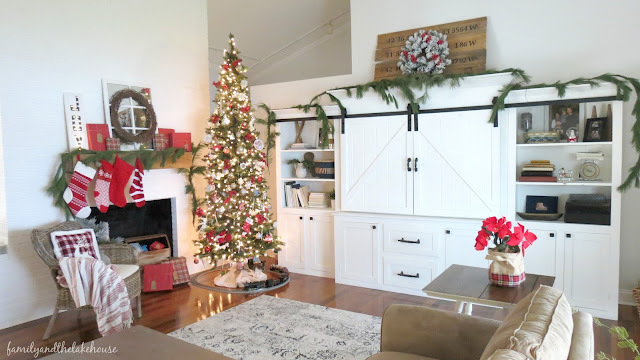 I shared our Holiday Home Tour! We took the kids to "Letters with Santa" held at Henry's school. He once again wrote out a list and we mailed it this time, too! Speaking of Santa, our photograph was printed and ready! Oh my gosh, my heart could've burst upon seeing it! Mostly because Eliza's hair is actually brushed and it isn't a crazy mess (Haha! ), but also because both kids were truly excited and happy to see Santa. Oh my gosh, and you guys and we went to this place called the MALL! Haha! I think we only ever venture into a mall during Christmas...maybe. The closest mall is about forty minutes away, so it never happens. It was super fun, but I must admit that we weren't very good "mall customers" as we didn't buy a single thing. Not.A.Single.Thing. I know, sad, right? Well, I mean, I guess we did have dinner at Buffalo Wild Wings...which is located inside the mall. Does that count? Okay, I lied. We bought this for the kids - a bumper car ride at a place inside the mall. Oh my word, they were thrilled! 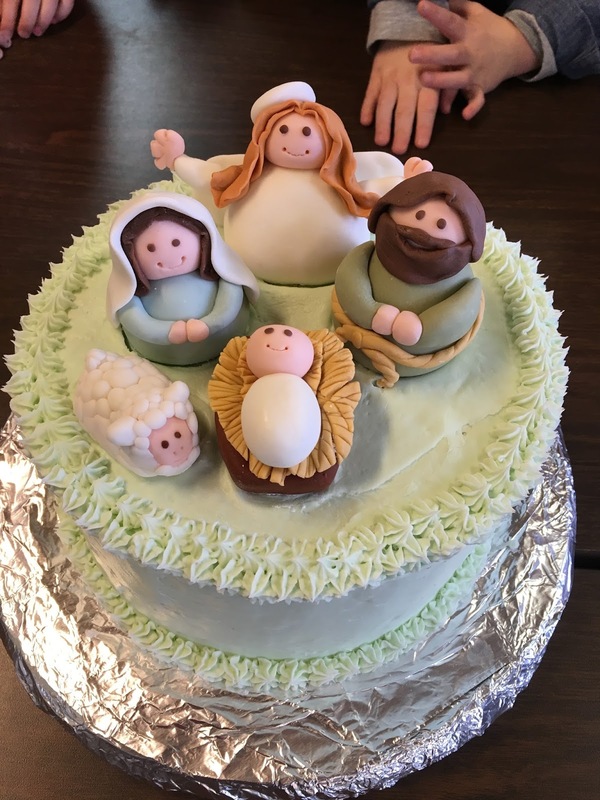 I made this nativity cake for Eliza's preschool Christmas party. ...and because I'm crazy here's a picture of me on our snow day we had last week. In this Mommy-land-world of mine it was just what the Doctor had ordered as I needed just one more day off from all the running around. So here you go - no makeup, messy hair, raccoon eyes and coffee in hand. Just keepin' it real. Alright, aaaaaaaaand on that note. I'll be done with this blog post of mine. Have a great day, everyone. Stay warm.